In a small jar with a tight fitting lid, combine the olive oil, vinegar, mustard, sugar, salt and pepper to taste. Cover tightly and shake vigorously to blend. Taste and adjust the seasoning. Set aside. Place the spinach, onion and bell pepper in a large salad bowl. Place the oranges in a small bowl. Season the salmon on all sides with a little salt and pepper. Place a large, heavy skillet over medium high heat. When the skillet is hot, add the remaining olive oil and swirl to coat the pan. Add the salmon, skin-side down and cook until the skin is crisp, about 4 minutes. Carefully turn the salmon and cook until the fillets are almost opaque throughout, but still very moist, or an instant-read thermometer inserted in the center registers 125 to 130 degrees, about 4 minutes. To serve, add the orange segments to the salad bowl, give the dressing a last minute shake and pour over the salad. Toss gently. Arrange the salad on 4 dinner plates. 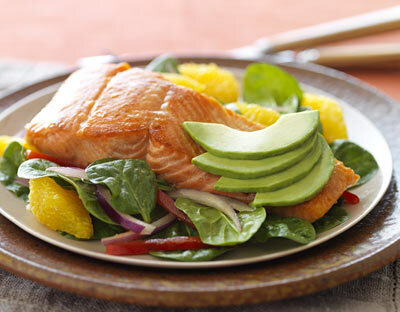 Place a salmon fillet in the center, on top of the salad. Garnish each salad with 4 slices of avocado and serve immediately. *Large avocados are recommended for this recipe. A large avocado averages about 8 ounces. If using smaller or larger size avocados adjust the quantity accordingly.